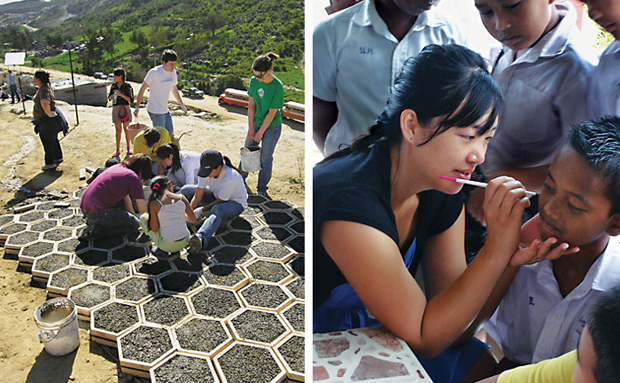 Left: Greeks Gone Green, a UCSD student organization, build pavers in Tijuana. Right: UCSD student Cindy Ly demonstrates face painting on her last day at the Baan Lang Khao English Camp in Thailand. The benefits of learning outside of the classroom will be explored at the University of California, San Diego’s first experiential learning conference, which is free and open to the public, from 8:30 a.m. to 5:30 p.m., Thursday, January 26 at UC San Diego’s Cross Cultural Center. The Education in Action: Experiential Learning Conference will examine the benefits of students getting an education from real-life experiences such as interning, working in the community, doing fieldwork, studying abroad and problem-based learning for current global conflicts. The conference has over 165 presenters who will be talking about a wide range of engaging projects and activities designed for college students. Participants include UC San Diego students, staff, alumni, faculty; visiting faculty from the University of San Diego; California State University, San Marcos; the University of Southern California; and other University of California campuses. In addition, high school students from High Tech High, Gompers High School and other local schools are expected to attend. “Research has shown that experiential learning helps students develop career goals and gain a sense of social responsibility,” Lin said. At the conference, students will be given the opportunity to describe how internships and practicum courses helped give them direction and faculty will discuss creative new approaches to education and the benefits of leaving the classroom to teach and learn. Experiential learning projects demonstrated at the conference will include designing sustainable engineering projects in the developing world, developing campaigns to prevent sexual assault and creating environments for constructive dialogue in the U.S. that can help bring peace to the Middle East. Registration and a schedule of talks are available at UC San Diego’s Sixth College website; click on the Education in Action: Experiential Learning Conference icon.